E-Z Out Skeleton - Serrated. 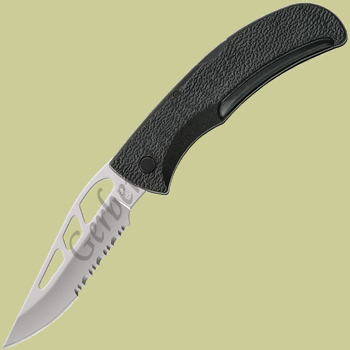 The Gerber E-Z Out Skeleton serrated model 06751 46751 is a full sized at nearly 8 inches when open. Yet even though it is full sized it weighs a mere 2.6 oz. It is very easy to open with one hand, hence the name, E-Z Out. The blade locks using a traditional lockback mechanism, and the high carbon stainless steel blade comes to you razor sharp right out of the box.